The Samsung Notebook 9 Pen should be lauded for its alluring design, wide selection of ports and security options, and for including the crucial stylus of the 2-in-1 package within the device. Of course, it would be that much better if that stylus didn’t get stuck inside if inserted the wrong way. There doesn’t seem to be any end to the 2-in-1 laptop craze in 2018. In fact, Samsung is doubling down on the trend with the new Notebook 9 Pen. This 13.3-inch hybrid laptop comes with Samsung’s storied S Pen included within the device – just like the Galaxy Note 8. That’s both a blessing and a curse, though, as it seems Samsung has a similar stylus problem to that of older Note devices: the stylus can get stuck inside the laptop rather easily. We hope that Samsung can resolve this issue, because otherwise appreciate the laptop’s other major benefits, like a gorgeous and colorful display, a wide selection of ports and plenty of options for secure login. Samsung is more than ready to show the Notebook 9 Pen to the world, namely the press, but still isn’t yet prepared to discuss price. However, the device will be available to US buyers within the first quarter of 2018, so before March of this year. While we don’t know the price, what’s inside leads us to believe that the laptop certainly won’t come in under $999 (about £999, AU$1,199). 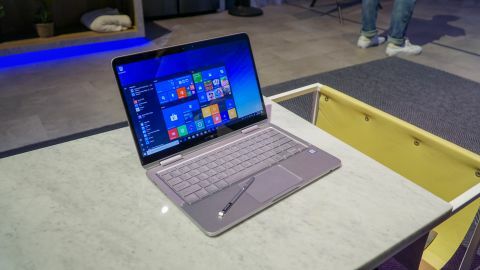 According to Samsung, the Notebook 9 Pen will come packing an 8th generation Intel Core i7 processor powering a 13.3-inch, Full HD (1,920 x 1,080) Samsung RealView touchscreen to start. Backing that up will be up to 16GB of DDR4 memory and up to 512GB of NVMe PCIe solid-state storage (SSD). Driving the whole package will be a 39Wh battery – almost half the capacity of what’s inside the nearly comparable 2018 Samsung Notebook 9, likely to make room for the included S Pen holster. The latest Notebook 9 model from Samsung looks quite similar to those of last year, but brings a few major design changes to bear. Namely, this silver-colored laptop bears a brand new type of metal chassis and now that included S Pen that slips right into the base of the device. First, Samsung calls this material Metal12, a new type of composite magnesium-aluminum alloy that’s actually lighter than aluminum on its own, and it shows. At just 2.2 pounds (995g), this is one of the lightest 2-in-1 laptops we’ve got our hands on yet and feels less plasticky than the brand’s fully magnesium notebooks. Second, again, Samsung’s included S Pen is both a blessing to this laptop and a bit of a curse. Naturally, it’s a blessing on account of it not only being included in the box, but stowable inside the laptop itself. The Pen doesn’t require power like all of Samsung’s styluses, and offers up 4,096 levels of pressure sensitivity as well as tilt detection for the full pen input experience. Plus, when the S Pen is removed from the laptop’s base, the company’s Air Command software immediately appears in the same fashion the Windows 10 Action Center does. This feature gives immediate access to Samsung-exclusive apps and functions, like Samsung Notes and the Autodesk Sketchbook. However, Samsung wouldn’t divulge how this works exactly, but it’s likely a firmware-level addition if the software is reacting to a hardware change like that. That said, the S Pen may also be a bit of a curse in that it suffers from the same flaw that older Galaxy Note devices did: the stylus can get stuck inside the device if you insert it the wrong way. To explain, if you insert the S Pen into the Notebook 9 Pen in such a way that the contour of its eraser button doesn’t match that of the laptop base, it will get stuck. But, hey, at least Samsung managed to include a wide variety of ports both modern and legacy in such a thin and light laptop. This 2-in-1 crams in a USB-C 3.1 port, a USB 3.0 port, HDMI-out, a microSD card reader, a 3.5mm audio jack and a DC power port. To top it all off, this laptop supports Windows Hello secure login both through a fingerprint sensor embedded into the side-mounted power button and an infrared lens beside the 720p webcam. Simply put, this laptop is absolutely stacked with features. It’s tough to comment too much on the Notebook 9 Pen’s performance when given such a short amount of time with the product. However, we can say that the backlit keyboard and Microsoft Precision touchpad work wonderfully. The keyboard offers surprisingly deep travel for the base’s minimal height, but could be a little more forceful in its feedback for our personal taste. Regardless, we were able to type quickly and accurately on the rows of keys. As for the touchscreen, it responds super quickly and remains firm under the finger when in laptop orientation, thanks to the two 360-degree hinges. Again, too much can’t be said for how well the laptop performs, given that Samsung hasn’t divulged exactly which part is inside the laptop. But, given that this laptop houses a nearly 50% smaller battery than the Notebook 9 proper and the fact that Samsung hasn’t disclosed projected battery life, we’re expecting a more modest power profile to show itself in a full review. The Samsung Notebook 9 Pen should be lauded for its alluring design and for including the crucial stylus element of the 2-in-1 package not only in the box, but within the device. Of course, it would be that much better if that stylus wasn’t able to get stuck inside if inserted the wrong way. That said, this is a seriously luxurious 2-in-1 laptop that both looks and feels the fit, using all new metals to achieve it. Not to mention an excellent keyboard and touchpad coupled with a bevy of ports and expansion options that should please both those up with the times and those still holding onto old standards. At any rate, here’s to hoping that Samsung can solve this stylus problem before its release this quarter, otherwise, we’re looking at a strong contender for our list of the best 2-in-1 laptops. Stay tuned for a full review later this year.